Yes, We Will Accept This Rose. Last week was a big week for us and not just because it was the best Bachelor finale to date. BTW, if your company didn’t have a party to watch the finale together well then…#workplacegoals. We did. And from what I hear, it was fabulous. I didn’t make it because I had #singleparentgoals. Lucky for us, all that love in the air from the Bachelor finale lingered throughout the week and we got to be part of someone’s real life Bachelor finale. Not that the Bachelor isn’t real life. If your first dates don’t include helicopters and competition, well then… #datinggoals. 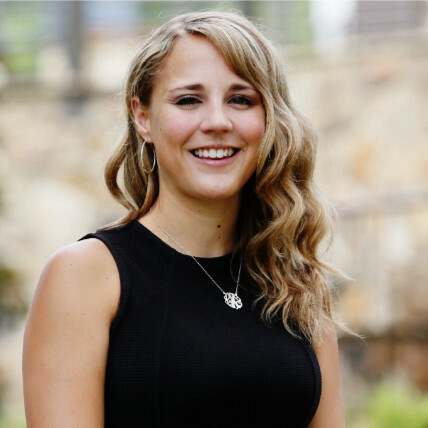 We learned about our mission on Wednesday when Katelin and I both got calls from Carrie Schlegel – agent extraordinaire to Fresh Paint buyers in Wendell Falls, Amanda & Brandon. 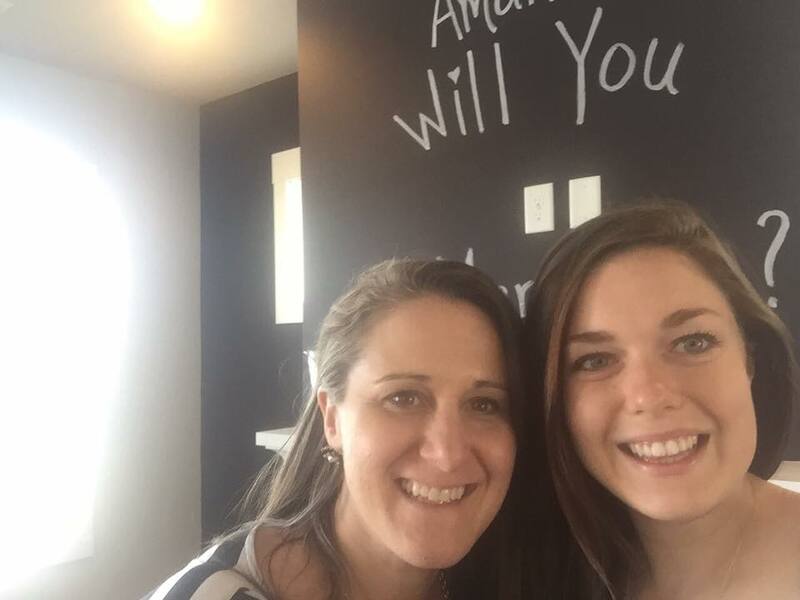 Carrie called to ask us if we would help pull off a surprise post-closing proposal IN THEIR NEW HOUSE! It’s safe to say Carrie pretty much had us all heart-eye emoji from the jump. We were SO in. Here’s Carrie & Katelin, drunk on love and surprises. This morning we got the whole story from Katelin and like any good surprise proposal she filled us in on the behind the scenes. We had our very own, ‘After the Final Rose’ rundown. 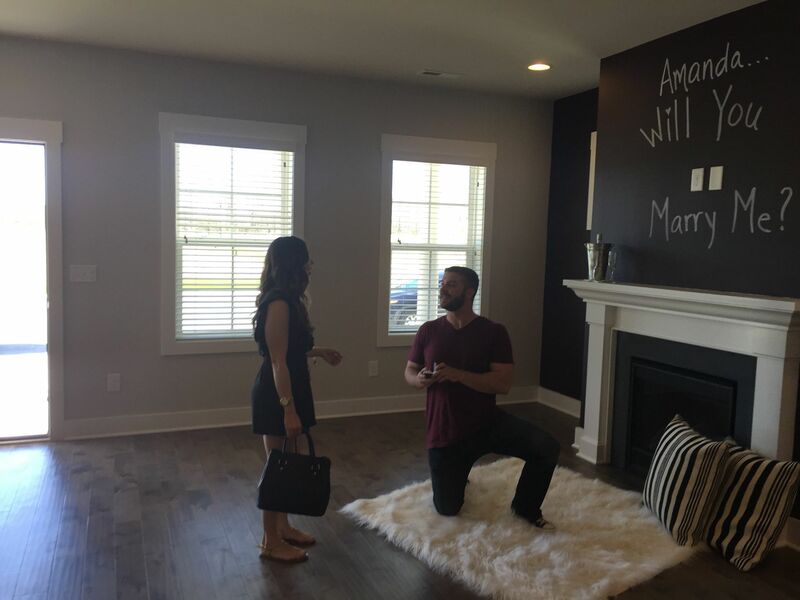 The plan was for Carrie & Katelin to paint ‘Will You Marry Me’ on the accent walls Amanda & Brandon had already marked for re-painting. You might be thinking…why are Amanda & Brandon repainting the accent walls of their brand new house? Well, good story, actually. Fresh Paint offers curated whole home design packages…what we don’t offer are changes of any kind. It’s our promise to our trade partners and how we’re able to offer such a high level of finishes at really ridiculous prices. We call the no changes policy a Fresh Paint No and we even have a sign for it where we make a big X with our arms. The #FreshPaintNo is as real as it gets. Amanda & Brandon originally asked us to repaint the walls as part of their offer. They just didn’t love the color. And because re-painting a few walls is simple, right? Right. And because it’s so simple, it makes it fairly easy for buyers to take care of after closing. Obviously, we’d love it if they loved the colors we chose, but Fresh Paint is all about the Rage Against Builder Beige. We can’t fault them for wanting it exactly the color they want. We know exactly what that feels like. We learned later that our #FreshPaintNo was pretty disappointing to Amanda & Brandon – that was hard to hear. Understandable. But now we’re so happy their proposal gets to be a part of their house. Like a secret love note – behind the color that’s just right for them. Katelin showed up at the house to hide in the nook so she could capture the moment Brandon proposes. 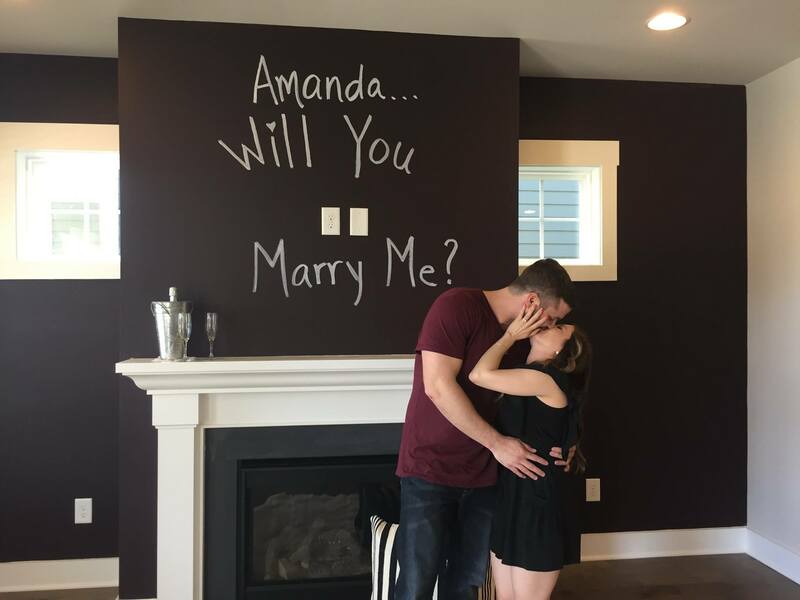 Only – when she arrived at the house – she found the painters Amanda & Brandon hired, already there! Repainting the walls! Thankfully they did NOT repaint over the proposal. I mean, can you imagine?! And yet, stranger things have happened in new construction, trust me. So about the time Brandon & Amanda are expected to pull up and Katelin is about to hunker down in the nook with the painters, the AT&T guy shows up to hook up their new service! I mean, not now, AT&T guy, NOT NOW! Katelin – in full on surprise proposal mode- quickly waives the AT&T guy into the house and tells him to get in the nook with the painters. Poor AT&T guy was trying to put on his shoe booties so he didn’t drag any mud in the house but Katelin was having none of it, ‘Screw the booties! Get in the nook!’she shouted. We were dying hearing these details. The picture of Katelin, the painters and the AT&T guy huddled in that space is just delightful. And this! We can’t even with this right now. Thank you for letting us be part of your love story. We wish you many happy years in a home we built with love. My husband and I love the openness of the floor layout, the vibrant colors, and EVERYTHING :-) It is a great home for entertaining family and friends, and compliments on the beauty, layout, and spaciousness of the house just keep coming! We love it!